Okay we are all professionals here, and as such we have to get up in the mornings to do our jobs… 627.am stands for the time that the developer of this wonderful Windows Phone 8 app gets up in the morning, well maybe not every morning, but the time is what gave it its name. 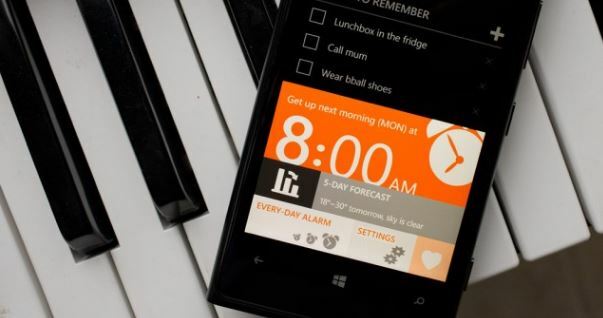 I can speak personally to this application, because it really was the only rock solid alarm I could use with my Lumia 920, along with that you could see the time/temperature on a Live Tile, as well as any reminders or tasks you set from the night before. 627.am has been updated to support Windows Phone 8 natively! Along with native Windows Phone 8 support there are some exiting new features like better gesture support for Windows Phone 8 devices, fast resume support, wide live tile, high resolution live tiles, new resolution support for 720p HD screens, e.g. HTC 8X, many bug fixes and improvements. If you want all these improvements now, you will have to pay 1.49, trust me, it’s worth it. The trail version works on Windows Phone 7.x and Phone 8 and may be lacking some features, but should help convince you to purchase the full version regardless if you are Windows Phone 7 or 8. Windows Phone Central also did their own review and have posted some pictures, along with Windows Store links to 627.am, check it out here!